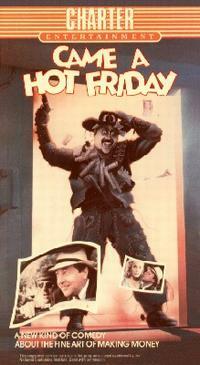 Came a Hot Friday is a 1985 New Zealand comedy film, based on the 1964 novel by Ronald Hugh Morrieson. Directed and co-written by Ian Mune, it became one of the most successful local films released in New Zealand in the 1980s. The film's cast included famed New Zealand comedian Billy T. James. In rural New Zealand in 1949, Wes Pennington (Peter Bland) and his partner Cyril (Philip Gordon) are out to run a horse-racing scam for as long as they can. They are inveterate gamblers who have joined forces to trick local bookies, by taking advantage of delayed broadcasts of horse races. After arriving in small town Tainuia Junction, Wes and Cyril get involved in a bootlegging ring, arson and murder. Among a group of local eccentrics, they also meet the Tainuia Kid (Billy T. James), a Maori who believes himself to be a Mexican bandito. He becomes a kind of protector for the duo. Morrieson’s novels featured some sexuality and violence, but the film downplayed these aspects of the source novel and concentrated more on the comical elements. Some argued that the film followed the spirit of the Ealing comedies. One writer argued that the book makes "good-natured, nostalgic fun of small town 1940s New Zealand where Friday night’s excitement is a pie and chips at the boozer" with "larger than life parodic characters". The film was released on DVD on 6 July 2011. ^ "Came a Hot Friday". www.flicks.co.nz. 6 July 2011. Retrieved 2011-07-06.